We have all the festive favourite's to ensure your party has that essential Christmas flavour. We guarantee to play the music you wish and style the party evening to suit your requests, 70's Disco, 80's Pop & Cheese or the Naughty 90's leading up to current charts, combined with all the top floor fillers. At Christmas at least 35% of the calls we get are from people who have booked a cheap mobile disco and the DJ has let them down at the last minute. 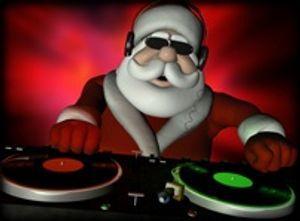 This happens because demand for DJs is very high at Christmas, even the unprofessional ones, and at the last minute they will often get offered better money elsewhere. Decades Discos are 100% reliable and I never fail to arrive as agreed, no matter what other disco job becomes available. Decades will send you a written contract so you know there can be no mistakes about where and when your party is to take place. You are guaranteed a professional DJ Service from the start of your enquiry to the final track. If you have been lumbered with the responsibility of organising a company Christmas party it can be very stressful and sometimes a thank less task. Many things can go wrong and after the event everyone will have an opinion on how things should have been done. You will need to ensure you hire party professionals who deliver the level of service that's promised. We offer free advice on all aspects of organising a party and are committed to help make your Xmas party the best Christmas party ever.